We are about to release our 2018 Agency and Marketer New Year Outlook survey report. In advance of the release, I thought I’d preview one of the more interesting findings coming out of the study. For years, agencies have been much more enthusiastic about the expectations for client spending (much more so than their marketing clients). As we dial back to 2011, and then move forward to 2015, marketing agencies always were much more positive than their marketing counterparts in terms of spending expectations for the coming year. With 2008 and 2009 being incredibly challenging years for marketers and agencies, by the time we hit 2011, agencies started to feel more positive about the economy and the likelihood of their clients spending at higher levels the following year. In-house agency shift (67% of marketers in our last survey stated they do some of the work (once done by an agency) in-house. Shift to project work (56% of marketers state that 26%+ of the work they assign is project-based). 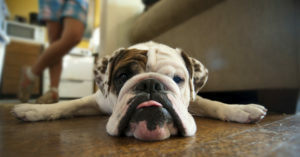 Growing competitive nature of the agency world and difficulty in connecting with you, the marketer (69% of agencies state it’s tougher to break through). In my opinion, if you marketers are truly going to be spending more than agencies expect to get, then you need to make sure the expectations are appropriately set with your agency. You also need to make sure the monies you’re directing in-house (presuming that’s where the other monies are going) is money smartly spent. 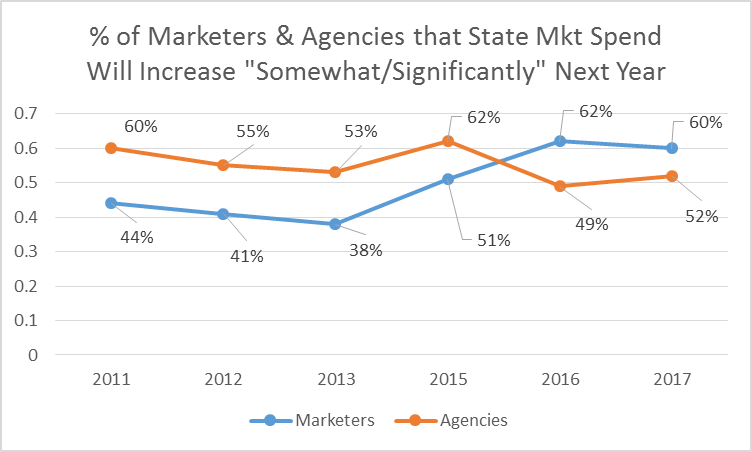 In this same New Year Outlook survey 71% of marketers state that they are likely to be looking for a specialty agency. This compares to only 47% in 2013. With the ROI demands on marketers growing, and the fragmented nature of the media landscape exploding, directing dollars to groups or individuals that can maximize your investment will be key. In-house agencies can be a good thing, but they are going to have their limits. Getting perspective from folks that are expert in a particular space can be of great benefit to your business. They can bring a variety of experiences and if they are worth their weight, can keep you ahead of the curve in this rapidly changing ROI-driven world. One thing you do have working in your favor is the fact that there are lots of firms out there hungry for your business. So not that you want to cheap your way into a relationship, but you are certainly in a good position to negotiate some solid terms.